I can't say I have ever felt an intense desire to learn about Estonian cinema, but thanks to an Oscar nomination the film Mandariinid (Tangerines) went flying onto my radar. I didn't do any research on the project in advance and the title is vague in every conceivable way, so when I began the film I not only wasn't sure of the premise, setting and tone of the whole thing, I didn't even know the genre I was about to experience. For all I knew, Tangerines would be a well crafted wacky comedy. It didn't take long for me to figure out that this wasn't the case. The well crafted part was certainly accurate, as this proved to be an immensely exquisite piece of cinema that while mostly minimalist, it somehow managed to feel far bigger in scope than it actually is. 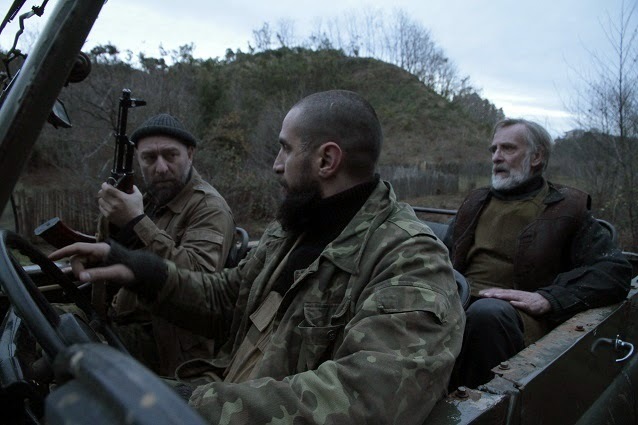 The film takes place in 1990 and the setting is a war torn location in the Georgia, Apkhazeti region, a village that harbored very few citizens during this time due to the dangers of war around them. Two Estonian men, Ivo (Lembit Ulfsak) and Margus (Elmo Nuganen) choose to remain at home however, as it is vital that they harvest that season's crop of tangerines. One day they find themselves facing an imaginable nightmare given their circumstances, caught in the crossfire between two units of opposing soldiers, and they escaped harm along with two injured but still breathing soldiers, one from each side. Ahmed a Chechen mercenary, Niko a Georgian, yet despite their differences Ivo decides to give them both safety and shelter inside his home, allowing them to heal under his roof knowing the tensions between these men would escalate in such close quarters. Beautifully performed, Tangerines is not even close to being the first anti-war film yet it still felt fresh given the setting and the power of the way the message is delivered. The movie is almost entirely dialogue driven and it works because it is so well written and meaningful, and while it certainly isn't flashy, the photography is stellar throughout, effectively utilizing the power of the landscapes and perfectly encapsulating the intended tone. I can't say I was completely riveted throughout, as I felt just a tiny bit of narrative drag once or twice, and I do mean tiny, but at less than 90 minutes and with plenty of moving, memorable sequences, Tangerines is certainly a worthy Oscar nominee. Looks good! Thanks Scott for the review. Added to my list to catch. Awesome, thanks for reading Barbara! I hope you enjoy the film!